Sorry, you’re not a winner. These words are painful for contest entrants who participated in your most recent competition. No one likes to hear bad news about not winning those VIP concert tickets or that $100 gift card to their favorite clothing store. Losing isn’t easy, and you don’t want it to create a negative perception about your business. But with a little planning, you can get the benefits of a high-converting contest landing page and preserve good relationships with everyone who didn’t win. By running a contest, you’ve attracted a lot of high-quality leads. Now, you must continue to engage them by redirecting their attention to something new—like your product, special offers, or upcoming event. In this post, I’ll show you how to turn your contest landing page into an opportunity to further connect with your target audience. Note that you will need to be able to do enough coding to modify the page template for your contest (or pass the template files along to your web developer). Or, if you’re a Leadpages customer, just look inside the Templates section of your account. The word free is an instant eye-opener for any audience. By offering contestants a free gift for their participation, you can gratify your audience before your business even announces a grand prize winner. It lets entrants know you value their time, and it makes the contest real for any skeptical participants. Plus, your new subscribers are likely to stick around longer to see if your business offers anything free in the future. This tactic is most practical if the free gift is some kind of digital bonus, such as an ebook, a product voucher, or access to an online tutorial. The best freebies are relevant to the audience’s interests and inspire contestants to join the fun. Disc Makers gives all sweepstakes entrants a free one-month online course subscription to over 11,000 guitar lessons. If the entrant doesn’t win the grand prize, she still gets to learn a few guitar tricks. I also like how they added the retail price of the free gift ($29.95) to emphasize the gift’s value. While you might not have an entire online course ready to offer your contestants, you can whip up a quick one-page checklist or a five-page guide for your audience. You can focus on giving people practical knowledge based on your industry expertise. For instance, if you’re a financial advisor, you can give away a checklist that highlights the seven major pitfalls to avoid during tax season. Or if you’re a writing coach, you may want to offer a free gift about how to write more in less time. Giving contestants something free is how you earn their trust faster. When consumers trust your business, they are likely to engage with you later. Once someone enters your contest, it’s so easy to just write a generic “Thanks for registering” message on the thank you page, and that’s what most business owners do. But there’s an opportunity to get contest participants to try your products with minimum resistance. They’ve already said yes to you once, so keep the momentum going with another simple ask. The first step is to decide what type of coupon you want to give your contestants. If you’re a consultant, you might want to offer a 15% discount on your signature services. Ecommerce store owners may limit their coupon to specific product categories. 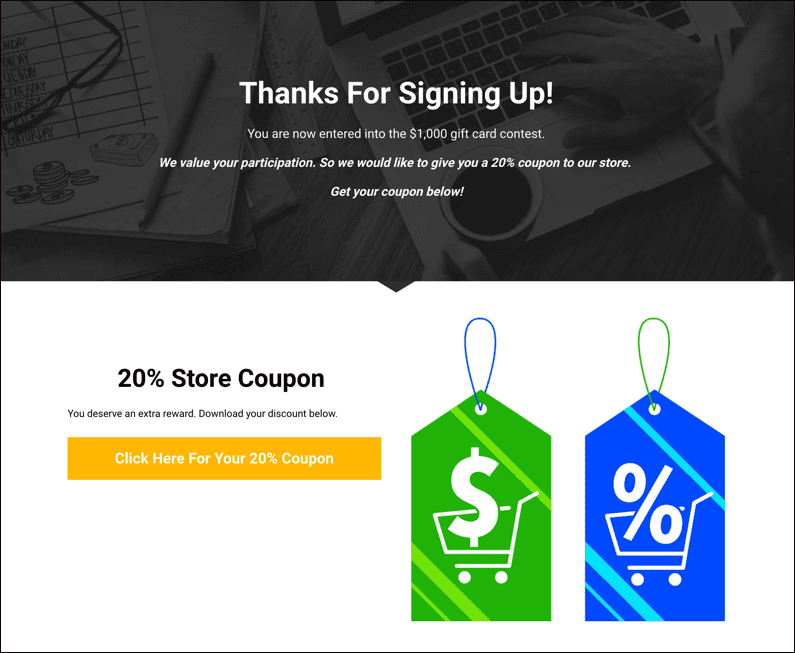 Do offer a coupon that will excite them to take the next action in your sales funnel, but don’t feel obligated to offer a huge discount (a little goes a long way). The next step is to set up your coupon offer on your thank you page. Just as you did on your contest page, you will create a call to action where people can enter their name and email address. Take a look at the example thank you page with a coupon offer below. If you’re sending entrants to an email marketing automation platform, like Drip, you can start delivering hyper-targeted emails to that particular segment. If you limited the discount to specific items, make sure you’re emailing information about those products. Sending customized content keeps your new subscribers focused on all the other kinds of value you deliver, not bummed about losing the contest. An initial email may focus on reminding subscribers to redeem their coupons. Then, you might start sending more relevant content, like product information. This is a great opportunity to get your new segment acquainted with your business. Whether they redeem the coupon or not, potential customers get to learn more about you and what you have to offer. The thank you page is the perfect spot to keep potential non-winners’ attention on your business. Combined with the right email message, you’ll build a strong connection. You can find more ideas for following up with contest entrants here. Contest entrants have shown an genuine interest in your brand, and they are willing to take small steps to engage. You can encourage more interaction by inviting non-winners to participate in a free Q&A webinar. This strategy is especially good for consultants or any business that rests on your expertise. So even though folks lose the contest, you can still deliver something of value by personally answering their questions. Plus, you have the chance to soft pitch your services at the end of the webinar. Another benefit of a Q&A webinar is that there’s little prep involved. No need to create a 100-slide deck with talking points. Rather, you can provide unique answers based on the questions from your webinar attendees. In your email, link to a webinar registration landing page that touts how you can solve specific problems and the value of getting questions answered by an expert in the field. Most consumers never get the chance to ask industry leaders direct questions. In the example below, Jonathan Fields created a simple webinar registration landing page. 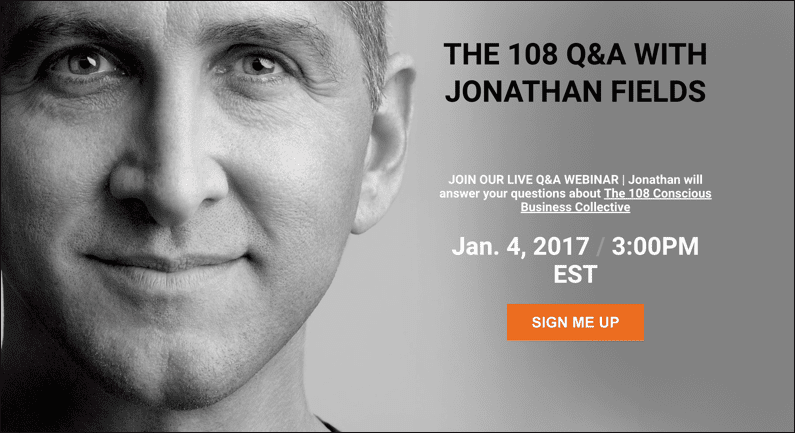 Jonathan tells his audience what type of questions he will answer and includes a contrasting orange call-to-action button to entice people to sign up. If you like, you can also use a hybrid webinar format that includes a presentation on an interesting topic and a Q&A portion. That’s exactly what Mindsteps did with their webinar page below. 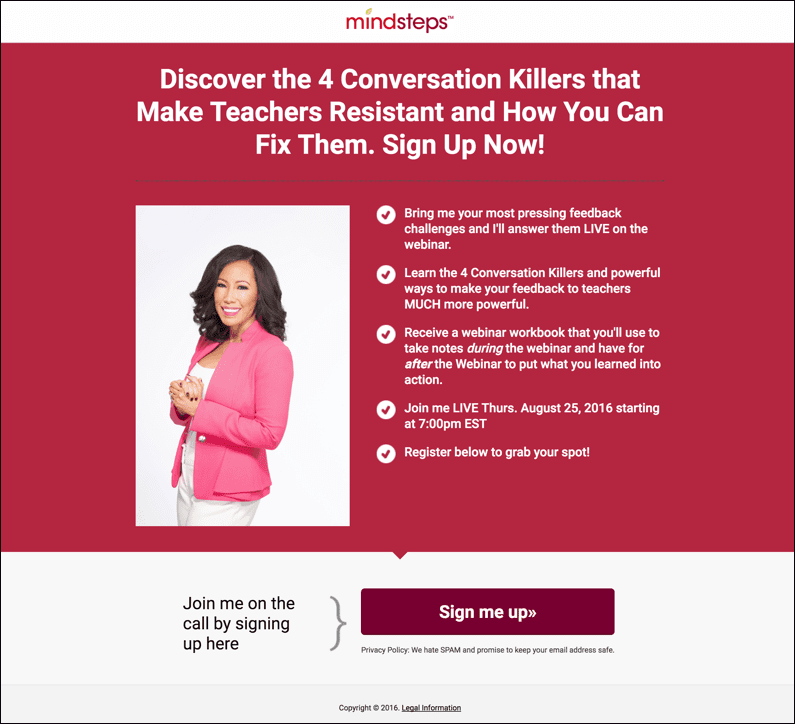 “Bring me your most pressing feedback challenges and I’ll answer them LIVE on the webinar,” the host promises in the first bullet. To give non-winners the extra nudge to join, I would recommend adding a countdown clock to your webinar registration page. It’ll prompt your audience to sign up right now. The thought of winning a contest doesn’t fade quickly, and people love dreaming about what they would have done if they had won the grand prize. You can harness non-winners’ imagination to keep them engaged with your business by giving them early access to your next contest. Because who doesn’t want a second chance at winning? I’d recommend offering this early access as an incentive for contest entrants to stay on your mailing list—ideally, at the same time you deliver the news that they haven’t won. If the prize is really impressive, you might want to announce your next contest with pictures of the previous winners enjoying their prizes. These images will make the contest seem winnable for anyone who didn’t make the cut the first time. 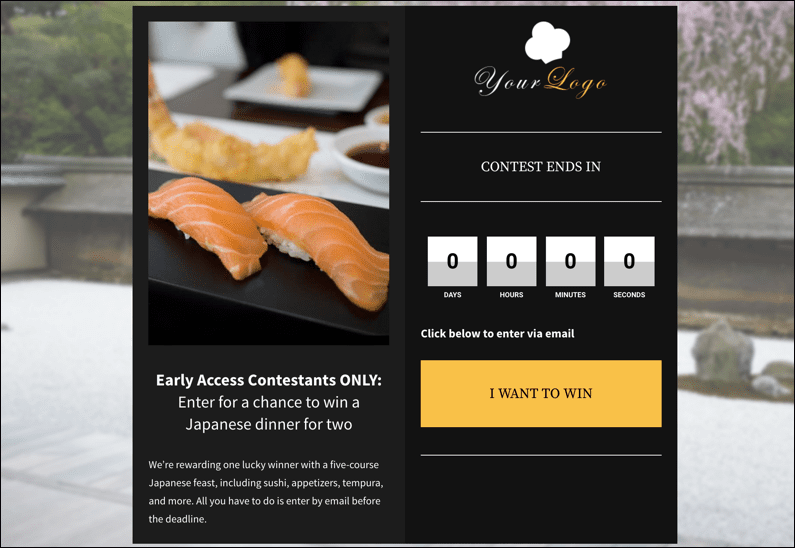 Then, you want to send non-winners directly to an early access contest landing page. In Leadpages, it’s simple to duplicate your pages. So you don’t have to create a whole new page from scratch. Watch the following GIF. Another option is to give non-winners some special treatment by offering to make their entries count as double or triple for the next contest. With more chances to win, your audience will think it’s a no-brainer to enter. After announcing your contest winners, it’s easy to forget about everyone who just lost. Take the initiative to engage with non-winners and show them what your business offers—you may land a few sales. Before you go, don’t forget to download your free Contest Starter Kit. 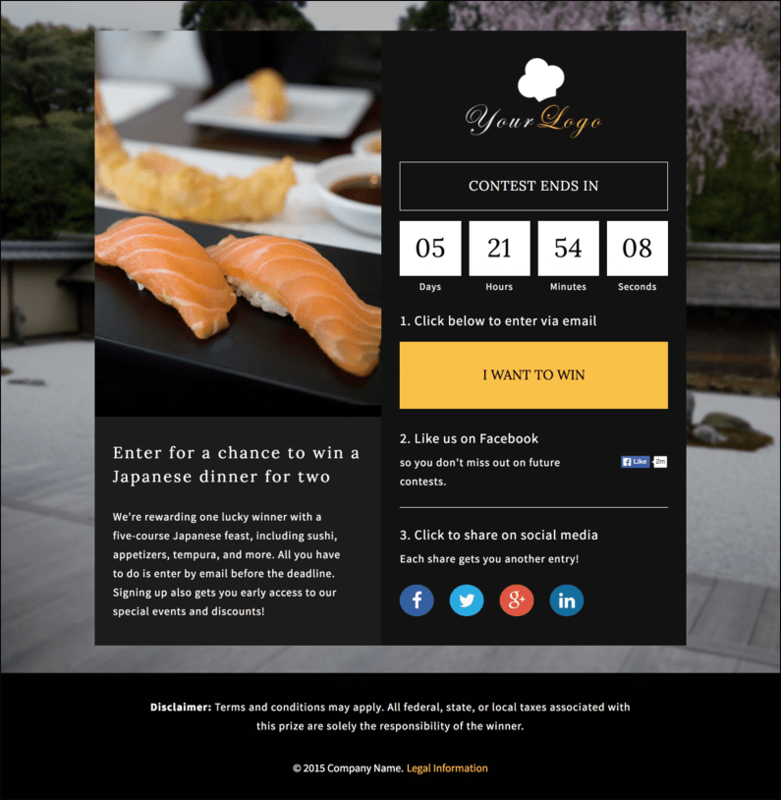 This template-email combo will help you achieve the most engagement from your next contest. Have you ever run an online contest for your business? Share a tip you learned in the comments.